Chloe is amazing. I say this a lot, but she just doesn’t stop amazing me. She did amazing on the drive out to Dayton, OH and back. On our way out, we stopped at the University Place hotel at IUPUI in Indianapolis. It’s a sort of sister property for Gateway Hotel where my mom and Aaron both work and we took a tour of the property on Wednesday morning. When we arrived on Tuesday night, things were a little rough, because Chloe woke up and wasn’t feeling so hot. We made it through the night with some extra snuggles and the remaining 2 hours of our drive was easy. We were all sick for most of the trip (Chloe had a fever, congestion and a cough; mom had the congestion and cough; dad got away with just the congestion) but we still had a great time with family. Chloe loved all the attention she got and had a blast playing with her cousins. Even though the trip out went well, we were still worried about the trip back. We were doing it all in one day, Chloe had been away from home and out of her routine for 5 days and she was still sick. This is the point where I will say again, she is A-MAZING!! From door-to-door, it is a 623 mile trip. With good weather, and all adults, the trip takes about 10 hours. We made it in 10 hours, 15 minutes. We only stopped twice – for lunch and an afternoon diaper change/leg stretching. Our second stop was at a gas station near Davenport. I hope we can remember exactly where this gas station was, so we never go there again!! The bathrooms were disgusting and the goods were covered in dirt/dust. It was gross. For the record, Chloe was changed in the backseat of the car. For as long as I can remember, I have made a bi-annual trek to Dayton, OH with my family to visit some of our wonderful extended family. I have lots of great memories and was excited 4 years ago when Aaron got to join me for the first time. This year is Chloe’s first chance to go, and although I am excited, we have to survive the drive first. From door-to-door, the trip is 612 miles. Six hundred and twelve miles with a cutie who has gotten restless as the weather has gotten colder and she’s been stuck inside more – but still able to run around. Six hundred and twelve miles with an adorable little girl who sometimes gets tired of being in the car on a short trip across town or waiting for a train. Six hundred and twelve miles…. On the drive out, we’re breaking it up into 2 days. Tuesday afternoon/evening, we hope to make it to Indianapolis. Assuming that Chloe falls asleep in the car for her regular afternoon nap and again around bedtime, she should sleep for a good portion of Tuesday’s drive. We’ll finish with just a short drive to Dayton on Wednesday. The trip home, however, we are doing all in 1 day. I’ve already resigned myself to the fact that Chloe will probably spend most of the 1024 miles with some sort of snack in hand. I’ve also accepted that we’ll be making even more stops than we did 2 years ago when we made the trip with 2 pregnant women with tiny bladders. We’ve been clinging to Chloe’s two nap-a-day schedule, even though she’s been giving clues that she might be ready for just one, in hopes that she’ll sleep just a little more during our drive. I have a few new toys for Chloe to play with and we’ve stocked up on DVD’s of her favorite show, The Backyardigans. (It’s her favorite, because it’s one of the only shows she gets to watch, because it’s one of the only shows mom and dad don’t mind watching!!) 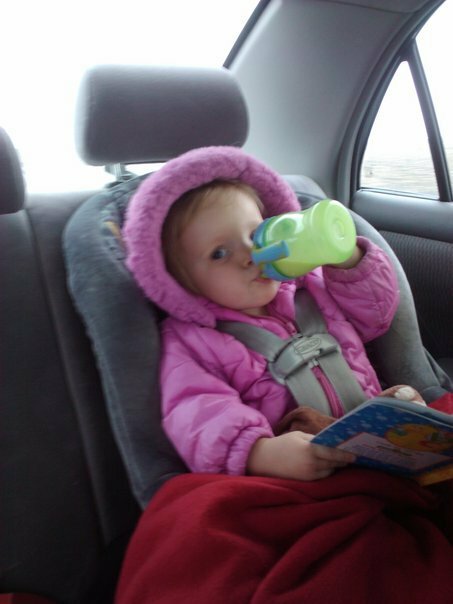 And Chloe will have mom, dad, Nanna and Dudad in the car to entertain her, aka – she’ll be in heaven. It will be fine. We will all survive. I’m aware of this, but I wouldn’t really be me if I didn’t worry, right? ?